“[The N brand] demonstrates the company’s commitment to manufacture responsive, intuitive performance vehicles that bring ‘fun to drive’ to a broad range of customers.” In other words, it will be affordable; a £40,000 Hyundai hatchback with 400PS would not appeal to a broad range of customers. 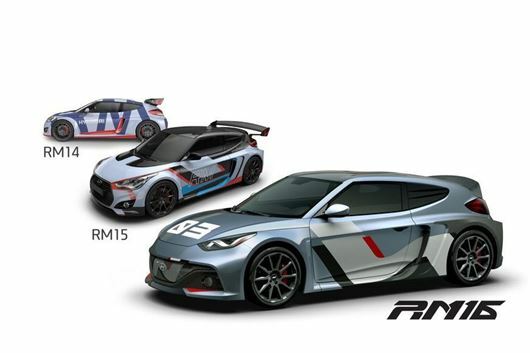 The RM16 follows the RM14 and the RM15, which were unveiled in 2014 and 2015 respectively and were designed to “test high-performance technologies and refine them for use in future high-performance cars.” It’s a two-seat, mid-engined concept with a 2.0-litre turbo petrol engine developing 300PS, and a body that uses carbon-fibre reinforced plastic to reduce weight. That’s the same material that BMW uses in the i3 and i8 electric cars, but while in those it’s primary purpose is bumping up fuel efficiency, in the Hyundai it’s to improve handling. The RM16 also uses electronic trickery extensively to improve cornering, engine responsiveness and basic excitement, including an electronic supercharger, an electronic differential to assist grip during high-speed turning, an electronically controlled exhaust system for louder noises, and an automatically adjustable spoiler to improve aerodynamics. How much of this stuff will make it into the production N cars isn’t clear, though Hyundai is clearly serious about making them as engaging to drive as possible – it looks as though the i30 N will be a solid Golf GTI rival, at the very least.